Like everyone I’ll be watching the U.S.-Germany match today, intrigued not just to see how the American side responds against a favored opponent after Sunday’s emotion-packed draw but also by how all of the various scoring outcomes in both Group G matches can affect who advances should the U.S. lose today. You’ve probably seen this grid, one that’s been passed around a lot this morning showing what would happen with a U.S. loss according to lots of different final scores in the two matches (click to embiggen). 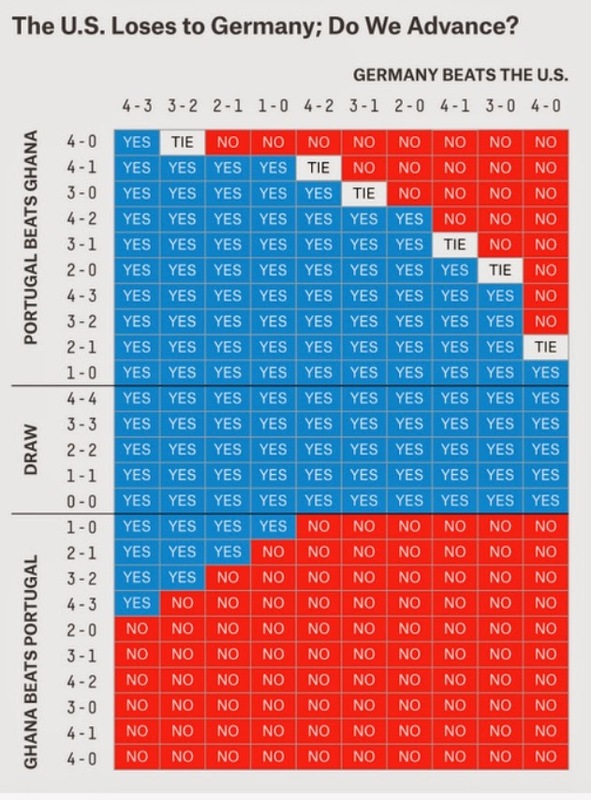 A quick glance shows a Portugal win over Ghana would be preferable, although even in that circumstance there are ways the U.S. misses advancing. The grid makes me think of one of those how-to-play blackjack cards that spells out when to hit, stand, double down, or split according to your own cards and what the dealer is showing. For poker players, it perhaps also recalls either those starting hand charts considering hole cards and position that advise whether to fold, call, or raise, or the grids produced by those equity calculators comparing a hand or range versus an opponent’s hand or range. Interesting how not only do the various scenarios for advancing alter with each completed match, but so, too, do the perceived goals for the teams involved. The U.S. started with modest expectations, but that first win versus Ghana swiftly changed expectations and then the prospect of a win during Sunday’s match changed it even more. While some may think a game without a lot of scoring suffers from a kind of stasis compared to other sports, the truth is nothing ever stays the same in the World Cup. While I’m not a huge soccer fan, I do watch occasionally and always follow the World Cup pretty closely, regardless of the U.S.’s involvement. A Spanish friend asked me the other day which teams I root for (besides the U.S.), and I replied that I’m mostly swayed to pull for teams from Europe and South America, mainly because I’ve traveled to both places a lot and am friends with people from the countries involved. I was in France in 1998, actually, having lived there for a year and actually left just before the World Cup got started that summer. Was impossible not to get caught up in the lead-up while there, and of course followed closely upon returning to watch France earn the win. Speaking of charts and grids and sorting out possibilities, I’ve always liked the World Cup’s method of working out how the 32 teams play down to a winner, with the three-game “regular season” among the four-team groups with its tie-breaker scenarios involving goal differences. The system creates a lot of satisfying symmetries while also working as a system that seems a fair way to balance the rewarding of skill while still allowing for the vagaries of chance. There’s no guarantee, of course, that the best 16 teams advance from the 32 who start. But what would be the fun in that?